I'm taking my time with this series because I think that some of the scenes are still a bit intense for Z (he's eight in just under a month). So, we finally picked up Harry Potter and the Chamber of Secrets and he seemed to really like all of it except for the actual basilisk fight scene. I think there was a bit too much blood for him. And yet, when we finished, he immediately asked if we had Prisoner of Azkaban. I showed him that we did but told him that we might read a few other books first. I hope that the voices that I worked so hard to make consistent come back to me when we pick it up! As I promised, I read Earwig and the Witch with Z as his first DWJ read and he really liked it! I'm itching to read another one of her books with him. I just have to decide which one would be best -- maybe Enchanted Glass or Castle in the Air. And, on second read, I felt even more that this was going to be the start of a series. If I was a writer, I might try my hand at the further adventures of Earwig! 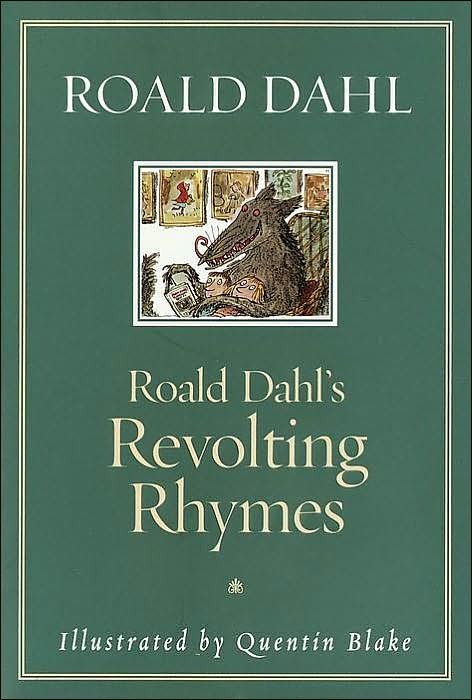 The last book we finished was Roald Dahl's Revolting Rhymes. I had never read this one before so it was fun for me too. It's a collection of classic fairy tales--Cinderella, Red Riding Hood, etc.--told in verse form and with slight twists that make them have less-than-happy endings. I don't know that any of them were revolting per se but some of them were kind of funny. Others were just strange. Z and I both seemed to find it to be a hit-or-miss volume. But, we liked it enough to continue on with Roald Dahl and Charlie and the Chocolate Factory as our next bedtime read. I LOVE that you are tackling Harry Potter with him!!! I miss the days when we read to the boys at bedtime. When they all wildly diverged in reading interest level, we stopped. But Jason used to read books and picture books and poems and all sorts of things to them. They loved it. I miss that a lot. I've read the first six Harry Potter books to my oldest now. We're waiting one more year for the last book as I think it might be a bit too intense for him. He's a very surface-level reader, and some of the books, I think we tackled too soon. I think it's good you're going slow with Z! Aww! I keep thinking of Z as a very tiny boy, much too small for Harry Potter, because I forget that I have now been blogging for several years, in which Z has been getting progressively older. How cool that you're starting his love of JK Rowling and (especially!) 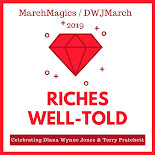 Diana Wynne Jones already. Jenners - I am so glad that he likes Harry Potter. :) The books take a lot of time to get through and he could easily complain or quit part way through. Jenny - I feel the same way and yet he's growing right in front of my eyes! The biggest challenge is trying to introduce the right books at the right time so that he isn't turned off by any of them. I really want to read The Wind in the Willows with him but I'm not sure it's time yet. I'm so glad that Earwig came along! We started reading The Chamber of Secrets just this last week with my son!! I can't wait to hear what you think of Charlie and the Chocolate Factory. My son LOVES that one and we have actually read it a couple times already! It is a common re-read here!! Tif - I'll be interested to see how your son does with the ending of Chamber. It's what made me decide to wait a few months at least before moving on in the series. And this is actually our second read of Charlie and the Chocolate Factory. :) It and the sequel were books that I reread over and over as a kid. Reading with my kids at night is such an awesome memory. They're late teenagers now. Now I have the grandchildren to look forward to!! :( Yes, I really am this far behind!